It's a banner day here. After about 4 years of effort, with frequent interruptions for work and other annoying obligations, trains are finally able to run the full length of the layout. This afternoon after adding in the last of the IDCs (insulation displacement connectors. Suitcase connectors to some), I ran a Red Ball from one staging yard to the other and back. The photo shows the train rolling into Jarvis, the most eastern station I'll be modeling. So I'm doing my happy dance, wearing the short bus grin, patting my hands together, etc, etc. This is a major milestone in layout construction. I can now make timings and develop the schedule. Scenery can now storm ahead. Look out bank account, Scenic Express is calling! Heck I can even have friends over and we can run trains! Astonishing! Speaking of friends. Here's some of the characters who have helped me get to where I am in such short time. Left to right, Dylan Harris, Tim Warris, the late Rich Chrysler, Trevor Marshall and John Mellow. The goof with the throttle is me. Missing from the photo, Geoff Chrysler, John Spring, Brian Dicky and Thorsten Petschallies. Then there's the fellows who provide the prototype data. Where would we be without them? Wes Dengate, Jim Rice, Ian Wilson, Helmut Osterman, Chet French, Rob Adams, and many, many more. There's still lots to do, but it's a living thing now. Think I'll go run a train. Over time I've improved my modeling skills and techniques. Little tricks that I've gleaned from other modelers whose work I admire or detail parts that are truly superb. And as I was working on a trio of UP ACR boxcars today I couldn't help but realize that "improved" details actually are easier than compromise solutions. Brake rods. For many years I would drill holes in brake levers, then bend little hooks in the wires to make a good mechanical connection and then add a touch of ACC to secure. Sometimes getting the rod that connected the live and dead lever right took a couple of tries. But now, by using cut up turnbuckle castings to replicate the clevis the job goes very quickly and looks so much better. It does mean making my own brake levers from 1x6 and 1x8 styrene, but even that is faster than trying to sand resin ones down to the right thickness. Better and faster. Bracket grabs. Kadee offers their bracket grabs as part of their detail parts line. These are the best bracket grabs on the market, period. The plastic is very flexible, to the point that you'd have to really work at it to break them. And they mount very easily. Drill four #75 holes and press fit, you don't even really need glue. The grabs are designed with a tapered square pin that really holds well. Sure beats farting around with brittle styrene offerings. So the object lesson is push your boundaries, you may find that it's a lot easier to get the results you didn't think you could. So it all started with this first photo. A pair of Wabash F-7s, a Wabash caboose and a Wabash SW-8 about to cross or having just crossed Talbot street in St Thomas. 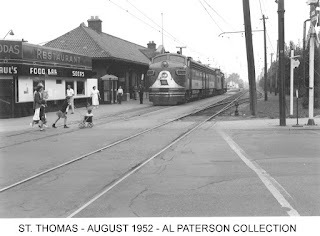 When I first saw this photo I had assumed that the photo showed a set of units returning from being serviced in either the PM/C&O shops or the NYC shops which was just south of this location. As the Wabash had no major servicing facilities in Ontario, they did contract with both of the other railroads to provide locomotive service. But my suspicious nature had me wondering if this really the story behind this photo. Then on Sunday past I purchased this next photo from Helmut Ostermann, which shows a Wabash train on the London & Port Stanley right of way. A right of way that is perpendicular to the Wabash trackage. (See the map below.) Helmut told me to contact Wes Dengate, a well known Wabash historian for the full story. Which I did. And it now all makes sense. 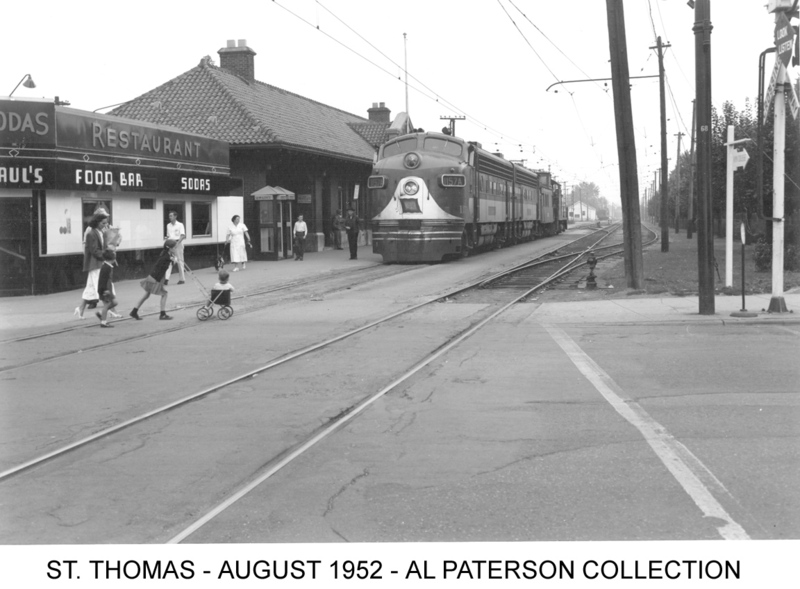 Both images are from the summer of 1952. That summer there was a strike by the car ferry captains on the Detroit River, which would have prevented the Wabash from moving any traffic to Buffalo. So the Wabash struck a deal with the NYC, C&O and L&PS to allow them to continue moving traffic across Ontario. 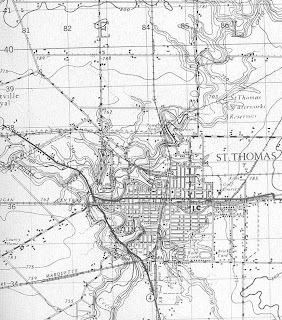 The Wabash was given permission to use the NYC tunnel in Detroit and they ran on the NYC trackage as far as St Thomas. Red Balls would pull into the St Thomas NYC yard, then a SW-8 would couple onto the rear to keep slack out of the train as well as assist in breaking the train to keep the level crossings clear. 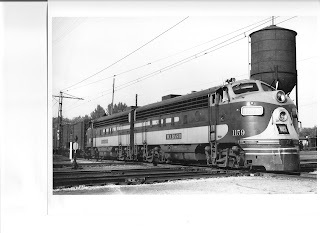 The train would back around the curve onto the L&PS/C&O trackage, then proceed north, across the NYC and across the Wabash main out over the L&PS trestle over the Kettle Creek. Then again back around the west leg of the wye, and finally get onto the Cayuga sub and resume normal activity. You can follow all this on the map. You may wonder why they didn't use the curve on the north side of the NYC main. That track radius was too tight for mainline equipment. The further explanation of the first photo, why is there no freight cars, is clear now. 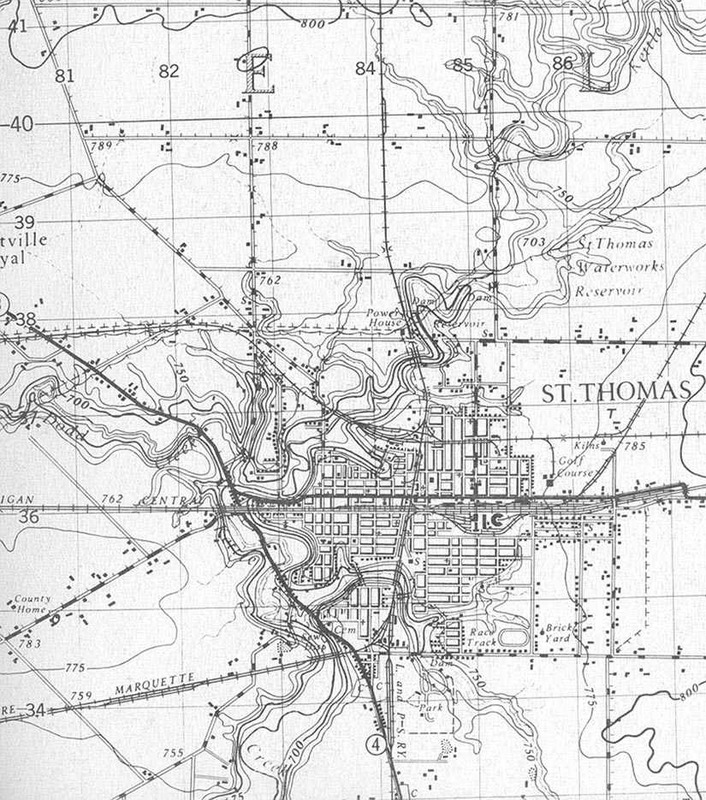 St Thomas was a crew change point. Under normal circumstances west bound Red Balls would leave the consists standing to the east of the CPR interchange and run in to the yard with motive power and cabooses only, perform the crew swap, and then return to the train and proceed west. It is clear to me now that something like that is going on in the first photo we see. This whole maneuver must of played havoc with the timetables and frayed not a few nerves. This went on for most of the summer of 1952. But it is neat to note that 4 competing railroads worked together to solve a problem. Every now and then I get requests for smaller jobs, like a paint job and a custom decaling request. And usually they're straight forward. But they can lull one into a false sense of security. This car was sent to me, to be painted PRR Tuscan and lettered as you see. The origin of this model is a mystery. The box has no label, and there's no "Made in..." cast onto the car. But it's a nice little model that was factory painted and lettered. The first step was to attempt to remove the factory paint. To my amazement a bath in Scalecoat Paint and decal Remover didn't touch the factory finish at all. "Impressive! ", I thought. So painted over the factory finish with Scalecoat PRR Tuscan and was pleased to note that the factory lettering seemed to disappear. I left that to cure for a few days, so I could mask off the body and paint the underbody and end platforms black. Once I could no longer smell solvent from the body colour, out came the Tamiya masking tape, on went the black. As I pulled the tape off, most of the Tuscan along with the factory paint and lettering also came off! Solvents wouldn't touch this paint but it pulls off with tape!? I let the black cure, taped it off and reapplied the Tuscan. This time everything stayed in place. The model goes back to it's owner today. I hope he's pleased. I just finished weathering these 2 cars for a client. Along with the usual air brush oversprays, I used a relatively new product for a few of the streaking effects. Pan Pastels weathering colors. Similar to weathering chalks, but far less messy to use. And easier to control. I had seen a clinic on this material a couple of years ago in Naperville and at the time discussions were underway with the manufacturer to release a set of "weathering" colors. I picked this set up a little while ago and fiddled with them some. I'm very pleased with the results. This medium will now become a permanent part of my repertoire of weathering materials. This Saturday past, the CN Hagersville Sub layout of my late friend, Rich Chrysler, was open to the public for the annual H.O.M.E.S club layout tour. It was one of his hopes that we, his friends, would be able to get more work done on the layout and get it running for this layout tour. I happy to say that we succeeded. Led by his son, Geoff, a number of work sessions occurred following Rich's death which assured that the layout was more than ready for the big day. Geoff in particular, worked like a man possessed to honour his father's wishes. The 2 linked scenes of Simcoe and Simcoe South went from plywood to nearly complete in a very short space of time. On Saturday we had over 200 people come through to view the layout and in their own way pay tribute to his passing. It's still hard to believe that Rich touched so many lives during his short stay with us. The future of the layout remains unsure, but Geoff very much wants to keep it going. There's still much to do and untold hours of operations to come. And first we have to track down all the little gremlins that popped out as soon as visitors appeared. Everybody stop looking at the layout! Geoff has posted some nice video of the layout on YouTube. Have a look.